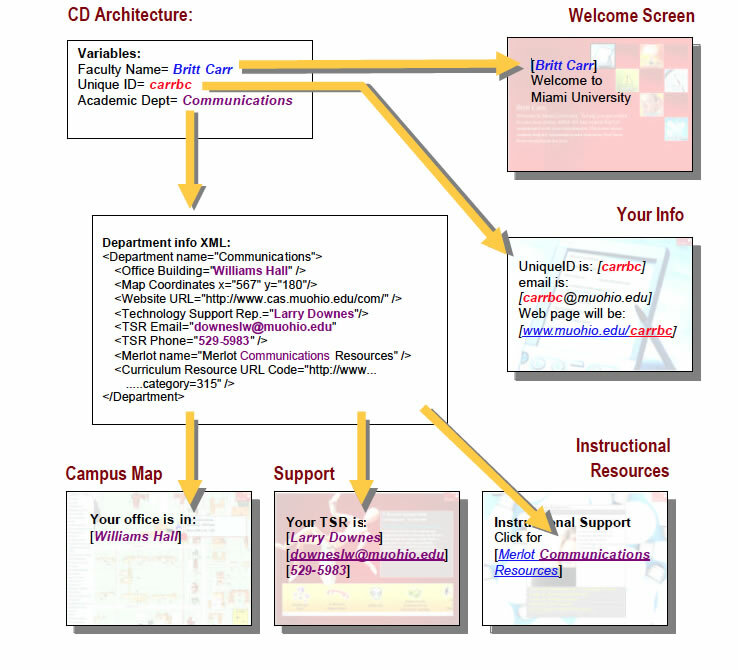 This project was undertaken to introduce new faculty to the technology resources available at Miami University. Using Flash and XML, it was possible to combine all the commonalities faculty have with specific personal data on a single CD. This combination created completely personalized information including network account settings, departmental library and technical support representatives, user-centered campus maps, academic resources, and discipline specific online learning materials. Duplicating this effort for each faculty member required simply changing userID and academic department variables for each CD. Because of the CD’s success, similar projects in other areas were spawned using the same architecture. academic department’s support representative contact information. reveals the buildings location in relation to their office. complete list of grants and resources are available. This entry was posted in Adobe, Interactive, learning activity, Maps, training, Uncategorized, Video, website by Britt Carr. Bookmark the permalink.